I had such a special experience volunteering at Jacksons Lane for Christmas 2016 that I signed up again for 2017 and even ended up joining the Christmas Day Committee! 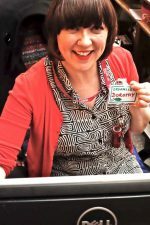 As I also work as a Front of House assistant there, I was asked to make sure everything in the building ran smoothly on the day. I got to Jacksons Lane bright and early on December 25th to open up. Two of the studios had been transformed into festive lairs with multi-coloured decorations, the tables were set for the guests and the piano was patiently waiting to be played. Even the Christmas tree in the foyer seemed extra twinkly. I felt that same thrill of anticipation from childhood Christmas mornings when I would wake up before everyone else and sneak downstairs. Everything was quiet and still and I savoured that peaceful magical feeling before the bustle and excitement of the day. I went around unlocking doors, switching on lights and put on some Yuletide tunes as the organisers and volunteers started to arrive. It was lovely to recognise faces from last year and to meet some new recruits too. As always, local legends Paul and Jan Brooker who have been running Christmas Day for over 40 years were at the helm. At 10am it was all hands on deck as the guests began to arrive. Guests and volunteers would stop by for chats and every now and then I popped in to the studios to soak up the atmosphere and check out the entertainment. Kudos to Ruth and Jeremy for organising such a talented and varied line up and Mo for his MC and musical skills. 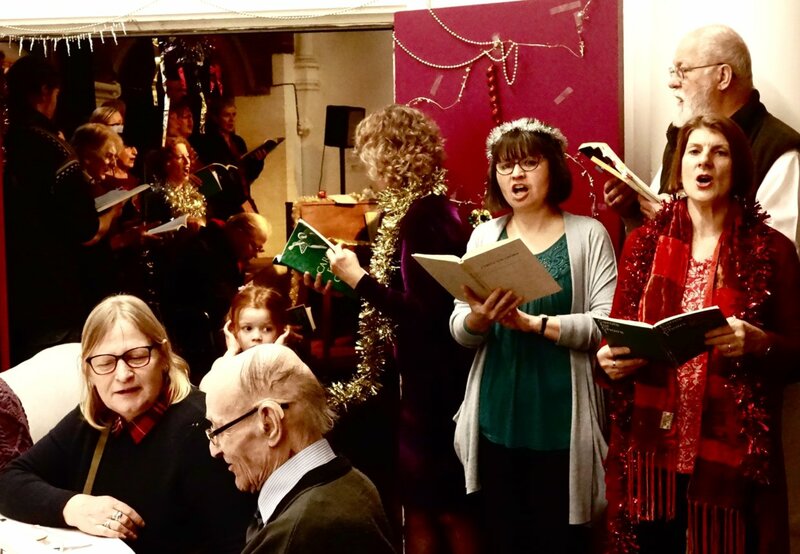 The Highgate Choral Society were fantastic, I was very moved by the carols and later I managed to catch a lovely performance by three young tap dancing sisters! At one point I got a visit from our wonderful magician Paul Mooney who performed a card trick that involved him not only guessing my chosen card correctly but also making fire appear momentarily from his wallet! 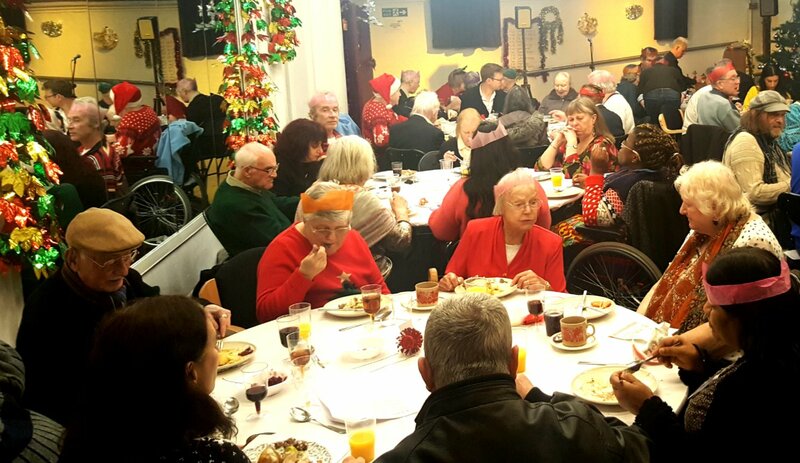 After the guests had been brought a lovely traditional Christmas dinner prepared by Gus and his whizz team in the kitchen, the volunteers got to sit down and enjoy the delicious meal together too. Later, when dessert had been devoured, there was another treat. Our VIP entered the building causing great excitement. The man himself, the one and only, Santa Claus Esquire! He made his way around to every table chatting and giving out presents to each guest, it was very sweet. At 4.30pm things started winding down. Coats were collected, doggy bags distributed and the drivers arrived to drop the guests home. I really enjoyed chatting to them as they waited for their lifts. Even at the end of a long day they were in good spirits and we had some laughs. A few of us stayed on to tidy up and at 7.40pm I locked up the building and made my way home - tired but feeling the love. It’s incredibly rewarding to be a part of the community effort and a privilege to talk to so many interesting elderly people who I would not get to meet otherwise. Roll on Christmas 2018! Christmas Day could not happen without the support of our generous donors – thank you. Find out more about how you can support Jacksons Lane.